As you can see from the accompanying photographs I’m both having fun and making progress setting up my new reef tank. 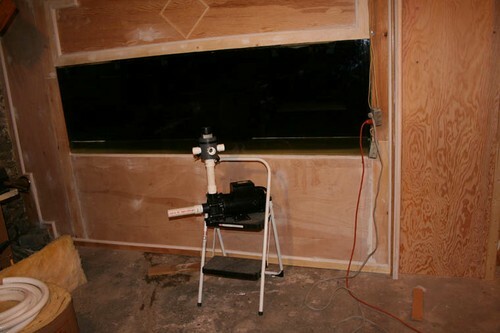 Even though many people can afford to hire carpenters, electricians, and plumbers to set up a reef tank, doing so will prevent one from having the fun and sense of accomplishment from developing and using many of these necessary skills. Perhaps it’s my way of bonding with a new reef tank. I suppose only reef keepers understand how one bonds with their reef tank. One of the wonderful things about our hobby is the sharing of and search for new equipment and ways of doing things. 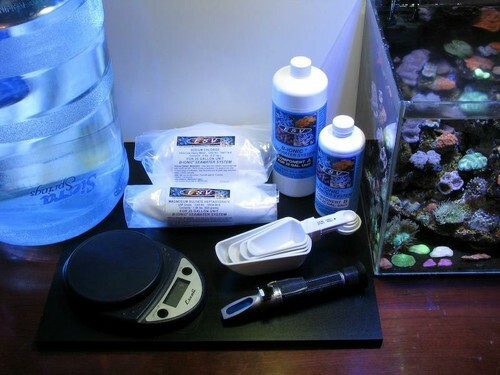 In this connection the arrival of volume 3 of The Reef Aquarium, by Sprung and Delbeek proved to be invaluable to even an old timer like myself. For those of you who read last month’s editorial know that I was trying to decide whether to go with a deep sand bed or just a light covering on the bottom for appearance’s sake. Since that time I got a copy of volume 3 and carefully read the chapters on setting up a reef tank. It reinforced the belief that I already had – a deep sand bed composed of oolitic sand is the way to go. And, now I don’t have to worry about my green wrasse being able to bury itself at night, and my Florida cucumbers that I collected many years ago with Julian Sprung, which have faithfully cleaned the substrate in the old tank. 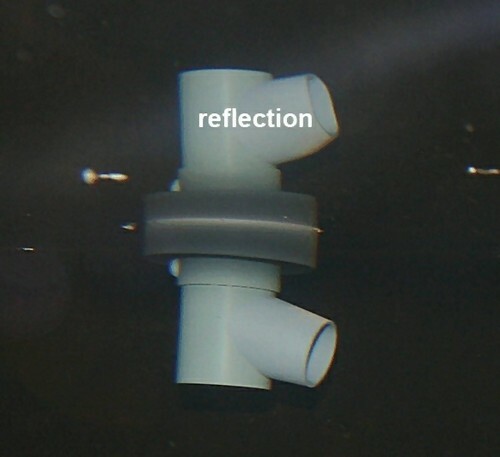 Furthermore, even though I have been working with PVC for many years I occasionally had problems with treaded fittings leaking, especially those under pressure. After reading chapter three, I realized that I was over-tightening the threaded connections and thereby breaking the Teflon tape. This is one case where the old quip; “if you can’t move it, use a bigger hammer” doesn’t apply. Even more exciting for an old timer like myself is the discovery of some new technology. My discovery came from reading our own forums. I found myself intrigued by the thread where Len has been describing with words and pictures how he is going about setting up his reef tank. See this thread for details. 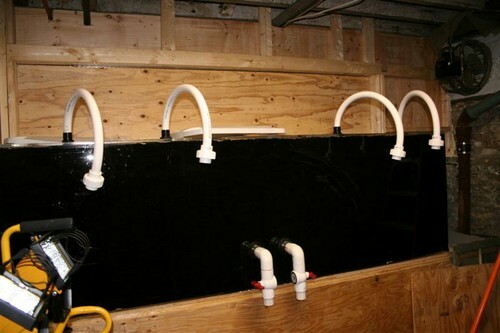 Ocean Motions has designed a state of the art water circulation system that Len has plumbed this system into his new setup. It is also described in volume 3 of TRA, pages 421-422. So, as you can see from the photos here I have decided to go with this system also. The photograph showing the back of the tank shows how I use flexible PVC to avoid 90-degree elbows. I’m using a Sequence Reeflo Hammer Head Pump. Using only 300-watts, it can push out over 5000-GPH. 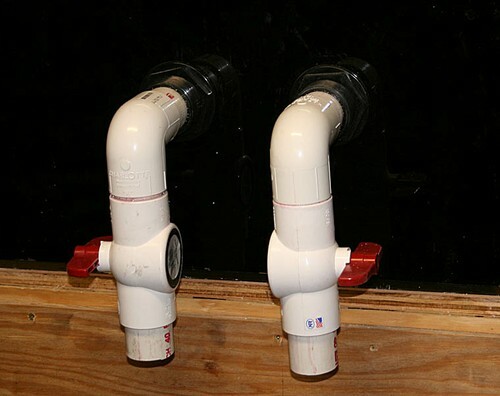 However, its output can easily be lowered when pumping into resistance, therefore the flexible PVC. I have used Jacuzzi high pressure pumps in the past, which are designed to handle back pressure, but the price you pay is in electrical consumption, around 1000-watts, and heat. When I switched over from a 12-amp Jacuzzi pump several years ago to the Hammer Head my electric bill dropped over $50.00/month and the tank’s water temperature dropped 2-degrees. Finally, the 4 outlets returning water to the tank from the sump terminate in Ocean Current’s rotating heads called “revolutions.” Only one is pictured here. When water is directed to them they lower into the water and rotate 360-degrees at 45-degree intervals, and retract when the water pressure is relaxed, and in that way mate perfectly with Ocean Current’s motorized valve pictured temporarily connected to the pump. I have my valve setup to have two on and two off, but there are various combinations available.